The first Wednesday of every month is the Insecure Writer's Support Group, which was started by the ninja-captain himself, Alex J. Cavanaugh. 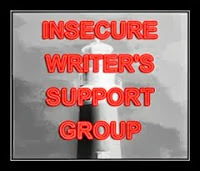 Check out the IWSG page to see the list of others who participate (or to join!). I successfully submitted a story to an anthology for the first time yesterday! So that's exciting. Now, of course, we wait to hear if it will be accepted, but I'm mostly ok with whatever happens. I put something good out there, and if this anthology doesn't want it, there are always others, right? There's part of me (a masochistic part? are all artists masochists in some ways?) that is actually looking forward to possibly getting a rejection. I guess it feels like getting rejections is part of being a 'real writer'. Someone who has been tempered and tested, so by the time there is an acceptance there is a little bit more legitimacy there. It means you've put yourself out there, had work critiqued by the industry, and been encouraged to keep working. Keep skill building, learning, reading books and taking classes. Not that I need any encouragement to keep learning things. What little nudges have you had lately?